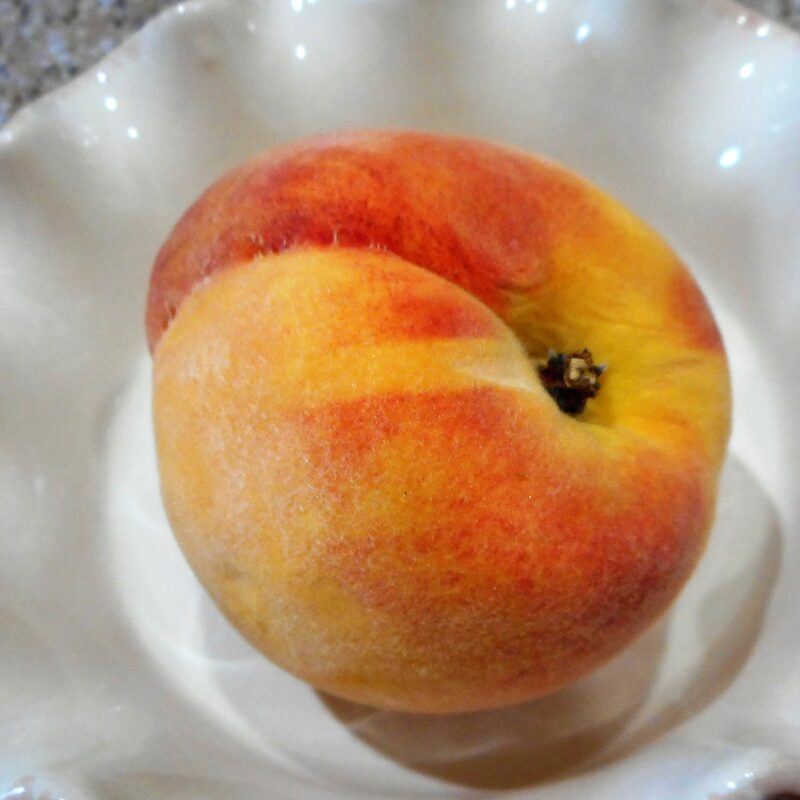 Mother Nature always has her own way of making things right, and one of the best rewards for living here thru our hot and humid Southern summer days are her sweet and juicy peaches. I don’t believe you’ll enjoy these same lucious jewels anywhere else. 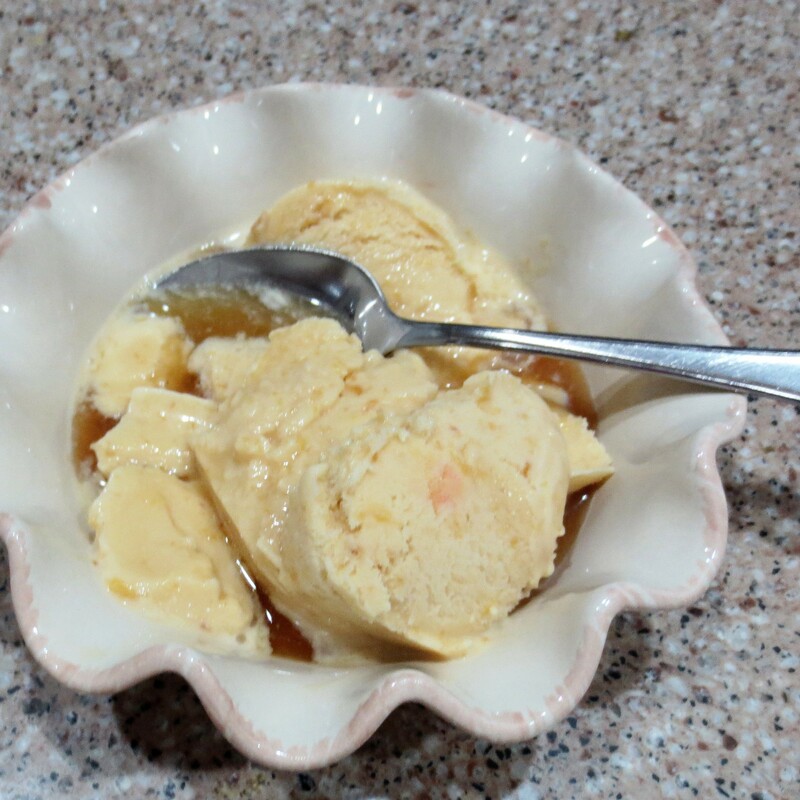 There is something almost mystical about sitting in the shade with a bowl of homemade Peach Ice Cream, but eat it fast before it melts! If you eat it quickly enough, you might even be able to get a second bowl. 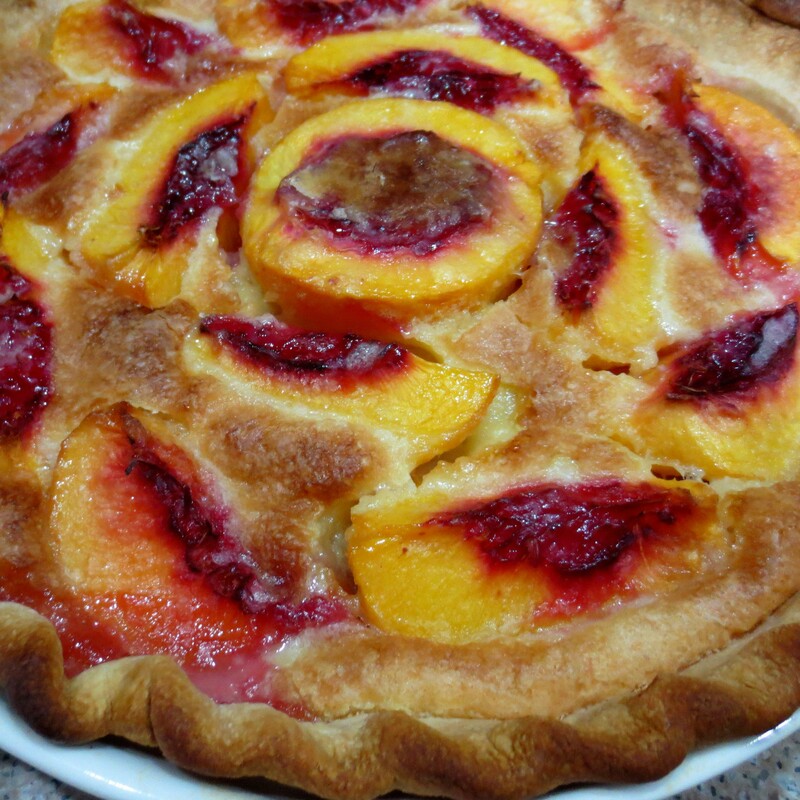 One long forgotten treat is this Fresh Peach Pie. The recipe came from my husband’s family. It’s a unique single crust pie in a custard base, truly something different and refreshing. It was a quiet Forth of July weekend for us. We used to go all out with crazy fire works battles and the whole nine yards, but since Bella came along we can’t do that anymore. Lizzie doesn’t care a bit, but Bella is deathly afraid of all the noise and spends the whole holiday shaking in fear. We just can’t contribute to that. Oh well, we save a lot of money by skipping the fire crackers! 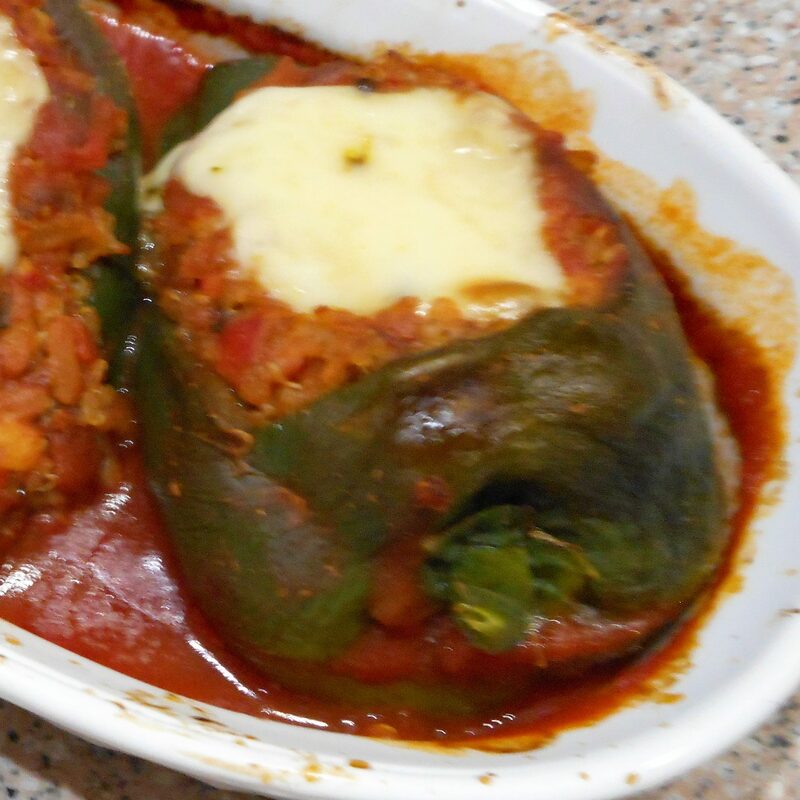 Since the Forth fell on Monday this year, we made Sunday’s meal meatless with a version of Quinoa Confetti Stuffed Zucchini stuffed into poblano peppers instead of the zucchini, which were wilted. When one veggie doesn’t look so good, just move on to the next. I could have used eggplant, too. 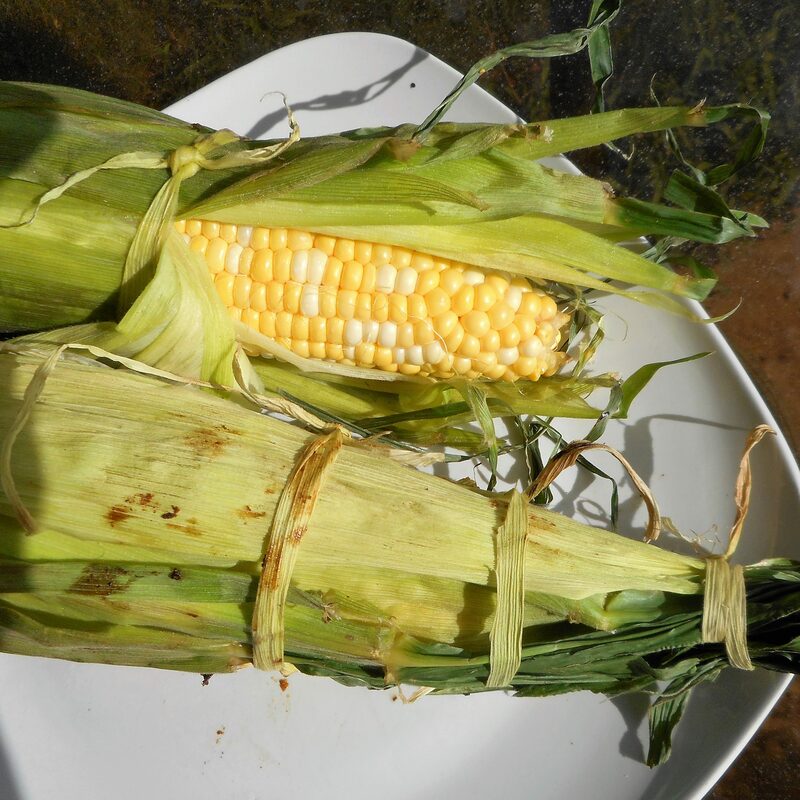 Monday, The Forth, was celebrated with our obligatory Smoked Ribs and a new to us side dish, corn roasted on the grill. To tell you the truth, I wasn’t impressed with the corn. We eat corn frequently, but I haven’t tried grilling it before. I probably didn’t do it right. Anybody have a good recipe for grill roasted corn to share? Tuesday’s dinner was much better. We enjoyed Mississippi Roast for the second time. This is a recipe I originally saw on “The Pioneer Woman” and it’s unbelievably simple. 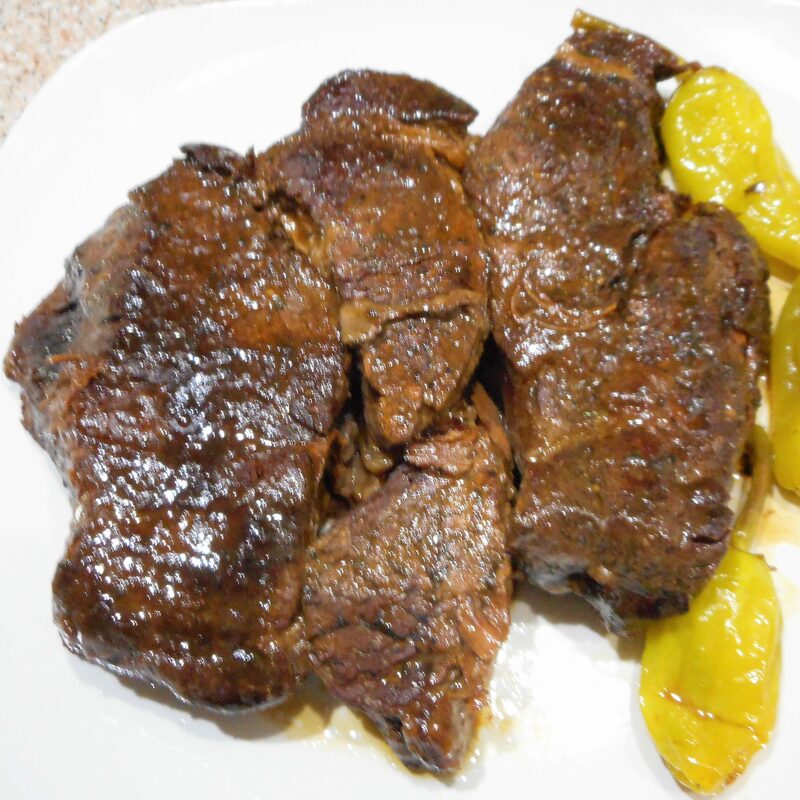 You just throw whatever cut of beef is on sale into the slow cooker with an envelope of au jus seasoning and a few pepperoncini peppers with a little of their juice and let it rip! 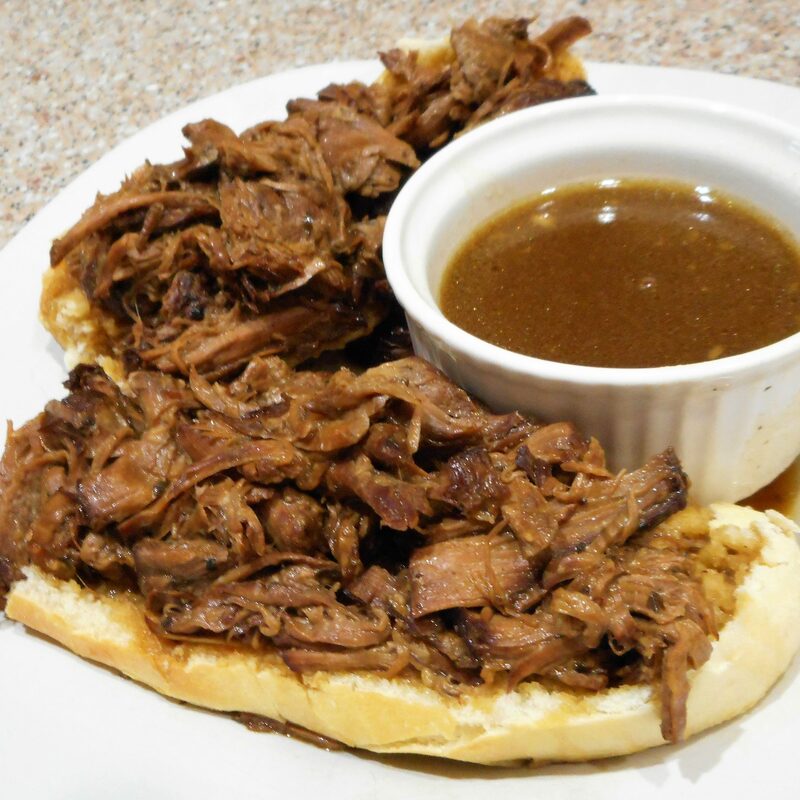 The leftovers made deliciously messy open faced french dip sandwiches for Thursday night, no cooking involved. I just shredded the leftover roast into a smaller slow cooker and let it do its thing till it was time to eat. Friday night was one of my favorites! 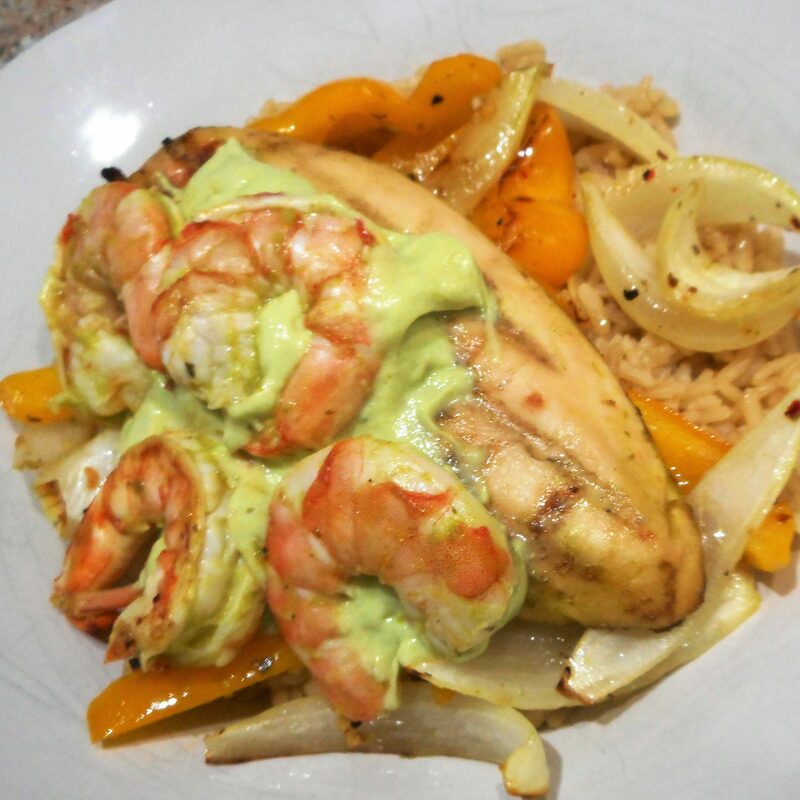 It’s a dish I’ve copied from Applebee’s restaurant for Tequila Lime Chicken and Shrimp with Avocado Cream . Oh gosh, I love that stuff! I’ve been working on copying the recipe for a while now,and I think I’ve got it pretty close. You don’t taste the tequila much, it just marinates the chicken and shrimp. I suppose you could substitute something else if you prefer not to use alcohol. 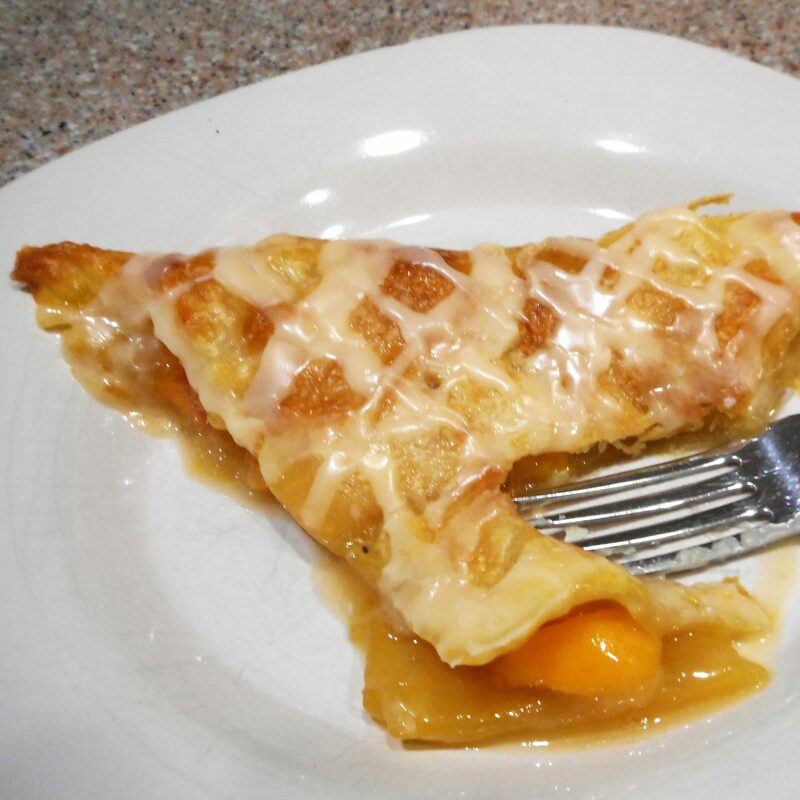 Well, that finishes it up, except for one more peach recipe, Peach Turnovers. These are incredibly easy to throw together, and you can make the turnovers with what ever fruit you have on hand. The only catch is, you do need to eat them right away. They don’t keep well. What a hardship! This entry was posted in Uncategorized and tagged comfort food, desserts, food, holiday, ice cream, peaches, summer on July 11, 2016 by lizziesmom2012.